I am still at the beach, and it is time for the Fêtes de Bayonne. The fêtes officially started in the 1930s and they are related to the famous running of the bulls in Pamplona. Please don’t ask me how. 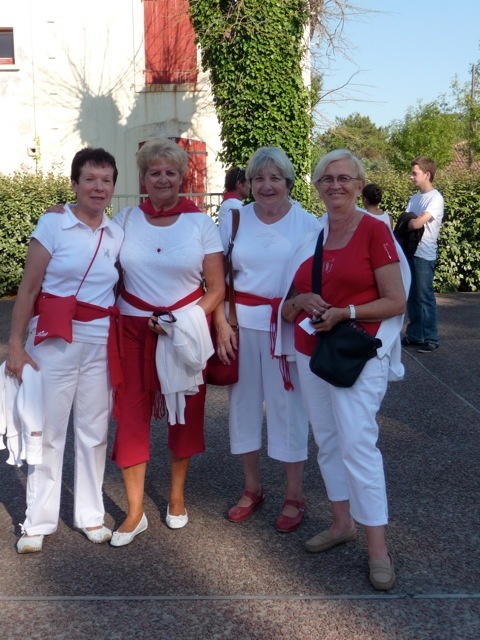 For the fêtes, everyone wears red and white, which makes it really beatuiful. Even the bullfights. 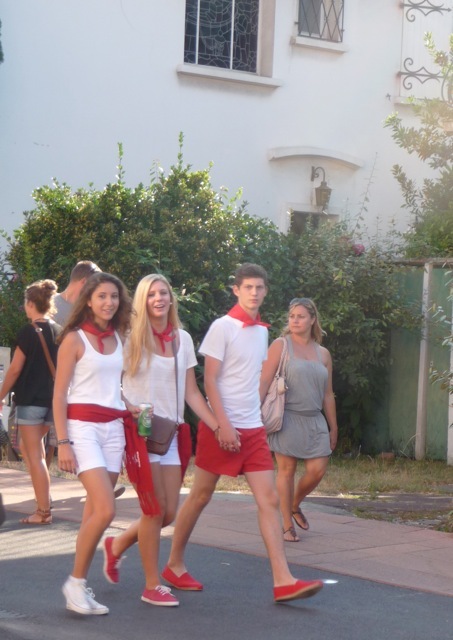 Yes, I went to a bullfight. you can’t judge one until you’ve been. Now that I’ve been, I can tell you, they are horrid. The bull does not have a fighting chance. I saw one bull so hopeless that he ran full speed into the ring, right in to the stands. His suicide prevented the torador his prize, but earned him a standing ovation from me. 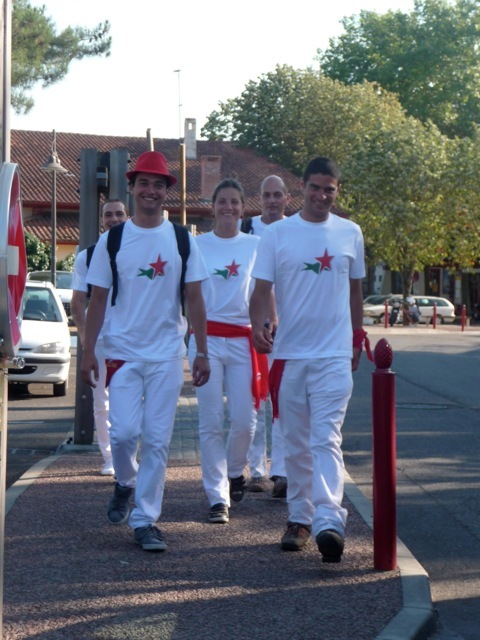 Today, the fêtes include bull fights, concerts, balls, the running of the calves, traditional Basque singing, with sing alongs on every corner, pelote (think Jai Alai) and a parade with floats. And beer. Copious amounts of alcohol has become ‘the thing’ at the fêtes. The Basque love their people very much. So much that they have put together a really great transportation system of buses and trains so that the 1 million+ people who attend the fêtes each year are not tempted to drink and drive. In Hossegor their is a shuttle that runs every 45 minuets or so, doing the 20 minutes drive that leaves passengers near the train station, a short walk from downtown and all the action. Mr French’s favorite part of the fête is the Pacquito. He does not participate, but he enjoys watching as grown men and women sit in a train, their legs around the person in front of them as they sing a traditional song (the Pacquito) and wave their hands forwards to backwards, above their heads, in unison. At some point, somebody stage dives on to the waving hands and is carried by the singers until the end of the line. 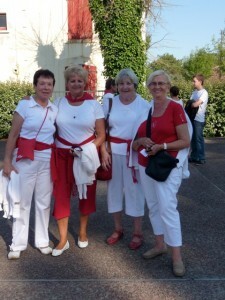 This entry was posted in Friday@Flore and tagged Friday@Flore by Sylvia. Bookmark the permalink. I hope we’re going to get a photo of Pacquito. You could make a little movie even! But I never had, and still do not have, a desire to attend a bullfight…your brief description confirms my gut feelings that it is not for me. I don’t think you need to go to a bullfight to know they’re horrid when it’s obvious to anyone that the bulls don’t stand a chance. If no one went, they probably wouldn’t be held anymore. I enjoy your blog but I’m sorry that statement is ludicrous. I am very sorry. It was not obvious to me. I had always thought it was just the toreador and the taureau, the two of them in the ring. I had no idea about the others. I would never have learned had I not attended a bullfight. Before attending a fight I found it impossible to believe that such a brutal, cruel tradition could be so very popular in a modern, European society. I still have a very hard time understanding how anyone can defend any aspect of this activity.